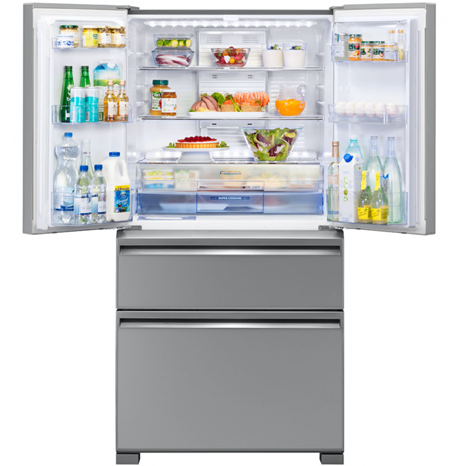 The LX630 French Door Designer Series Refrigerator sets a new standard in refrigeration. With a stunning glass flat panel design, large capacity and advanced functions such as Neuro Inverter Technology, Automatic Ice Maker and a Vitalight Humidity Drawer, this fridge is the perfect solution for anything from daily family meals to large dinner parties. Our lucky winner has a colour choice of Black and Silver LX, valued at $4,749.99 RRP. The LX630 French Door Designer Series Refrigerator from Mitsubishi Electric is designed for larger living. With a total refrigeration compartment of 333 litres, this refrigerator provides you with maximum storage for even the widest of platters. The LX also features door pockets that are 170mm deep, providing room for a total of five 3L milk bottles! The use of the super-efficient Neuro Inverter Technology combined with 9 monitored temperature sensors and Neuro Fuzzy Logic Technology to learn and adapt to your lifestyle makes the LX Series one of the most energy efficient French Door Multi Drawer fridges in New Zealand. You can now have fresh, clean ice on hand without any additional plumbing needed with the Non-Plumbed Automatic Ice Maker. With its removable water tank, you have the freedom to place this fridge anywhere in the kitchen. The Vitalight Humidity Drawer is designed to slow down the wilting process of leafy greens, using an intelligent LED lighting System to maintain vitamin and antioxidant levels for longer.